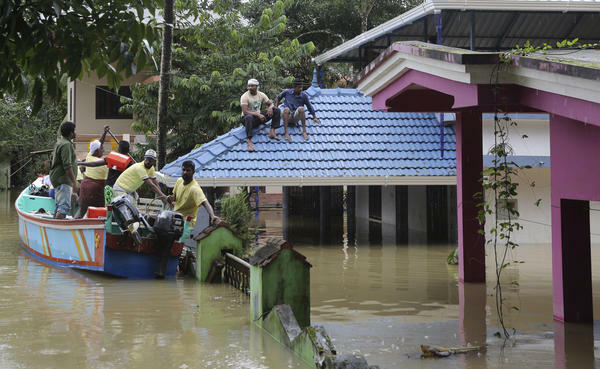 Volunteers in a boat help to rescue stranded people from a flooded area in Chengannur in the southern state of Kerala, India, on Sunday. India's southern state of Kerala may get some much needed relief in the coming days as the forecast shows less rain for the area that has been dealing with deadly monsoon floods for more than a week. More than 350 people have died and at least 800,000 others have been displaced, according to The Associated Press. But there are fears that the number of dead could increase as rescue and recovery efforts continue. Reporting from Mumbai, NPR's Lauren Frayer says that, "tens of thousands of people have been rescued from flooded homes ... but many more are stranded." Frayer reports that a red alert for flooding in the areas has been lifted and Kerala's chief minister Pinarayi Vijayan says the flooding "is under control." The monsoon rains caused massive flooding throughout the region and sparked landslides that have covered highways. The AP reports that "officials estimate that more than 10,000 kilometers (6,200 miles) of roads have been damaged." At Kerala's Cochin International Airport, runways are underwater and it is expected to remain closed until Aug. 26. In a press release on Sunday, India's Meteorological Department said that while more rain is in the forecast, it is expected to decrease gradually throughout the week. These improving weather conditions could make it easier for rescue workers trying to reach the nearly 10,000 people who are still stranded. P.H. Kurian, a top disaster management official in Kerala, told the AP he expects almost all of them to be rescued by Monday. In addition to the government's hundreds of boats and dozens of helicopters being used in rescue efforts, the BBC reports that "the coastal state's many fishermen are providing valuable support, using their own boats to help the relief mission." Government relief from other states is headed to Kerala and includes food and water, clothing, bedding and blankets and sanitary napkins, according to the Press Trust of India news agency. On Saturday, Prime Minister Narendra Modi visited Kerala and surveyed the damage from a helicopter, according to the AP. Modi also pledged more than $70 million in aid as the Kerala tries to recover.